The NEHGS library is located at 99 Newbury Street in Boston. The trip is only about 45 minutes (do not go at rush hour!) by car, and you can also take the bus from exit 4, get off at the Park St. Subway Station and walk across the common/park to Newbury St. This is a pleasant walk, even when carrying a briefcase, laptop and slogging through the snow. NEHGS is the oldest genealogical society in the US, and the largest genealogical library in New England. It is six floors of goodies for the family historian of all ages. You will often see grade school kids there with grandparents, and this is where I taught my daughter how to look up censuses on microfilm when she was ten years old. Most of the patrons used to be retired folks, but that seems to be changing now that the internet has opened up genealogy to a whole new generation of fans. Genealogists like to share their hobby, so this isn’t a library where you have to be quiet and scholarly. I often see strangers sharing bits of their family trees, often finding out that they are distant cousins! Feel free to wear your jeans or sweats. You don’t have to dress up as if you were visiting the National Archives or the statehouse in Concord! The staff is very friendly, and will help you get started if you are new to genealogy. A workshop is a great place to start, too, and you can even make an appointment for a personal one-on-one session with a genealogist while you are at NEHGS. 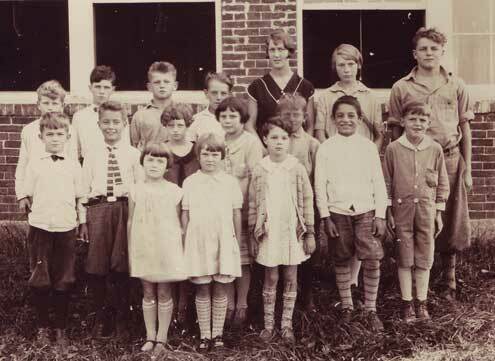 Teacher Pearl Reid (unconfirmed) "First row Second from Right Draper Parmenter"
On the first floor is a small bookstore stocked with lots of family histories, and books on local history and New England Lore. There is a great selection of “fill in yourself” family trees of all sizes, perfect for gifts. Check out the old family trees in the back hall by the elevator, filled in by seven or eight generations of Sears and Mayhew families for inspiration. There are workshops listed on their website. On the first Wednesday of every month at 10AM is a FREE talk on using the library for family research. Several other FREE lectures are listed, for example I am bringing my Mom to the one on February 28th at 10AM on “Researching your Police Ancestors” (great great great grandpa George Emerson served at the Fields Corners Police Station in Boston from 1860 to 1885) There are upcoming talks on Nova Scotia research, and Scottish ancestry. Check the website regularly for upcoming subjects. Please check out the website for a virtual tour of the library. NEHGS members can also access many databases and searchable scanned images of vital records and books through the website. As an alternative, the Leach library has a subscription to Ancestry.com, which also can grant you access to vital records, censuses, genealogies etc. for FREE if don’t have membership at NEHGS. Combine a field trip to NEHGS with a trip to the Vital Records in Concord, NH, a visit to the American Canadian Genealogical library in Manchester, and perhaps a stop at the local history room tucked in the back of the Leach Library. You’ll soon be hooked on the genealogy bug, too! Browse this map for detailed directions!